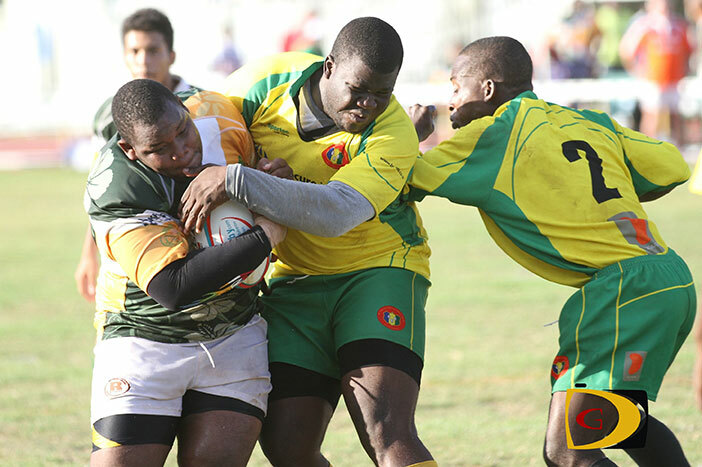 St. Vincent and the Grenadines held off the British Virgin Islands’ late charge for a hard fought 24-22 victory in their 2014 NACRA first round encounter at the A. O. Shirley Recreation Grounds on Saturday, after constructing a 12-5 half time advantage that grew to 17-8 by the second half. In the close match for both sides who are in a rebuilding stage, the visitors used their wing Godfrey Matthews and flanker Rasheed Campbell for the halftime edge. St Vincent got its third try in the 61st minute from Dugal James for a 17-8 lead, before the BVI began clawing its way back with a try from replacement forward Simon Knight in the 68th minutes, to come within 15-17. In the 75th minute, St Vincent used Kemi Francois’ try and crossed for a converted try and a 24-15 score. The BVI pressed hard late in the game from Captain and outside centre Donovan Staple in the 76th minute. With the conversion, the home side was two points shy at 22-24 but couldn’t make up the deficit, before time expired. BVI Coach Sherlock “Solo” Solomon, said it was a good victory for St. Vincent but think his squad could have won the game.